The arrival of Windows 10 is one that has been greeted by a surprising amount of positivity given recent Windows releases and the scorn that has been levied at them, but even while Windows 10 has proven popular in its short life thus far, it isn’t without its problems. One of those problems is the lack of any way to play a standard DVD, because just like Windows 8 and Windows 8.1 before it, Windows 10 cannot play DVDs without a little help from some sort of application. Microsoft will obviously sell you one, and we’ve already covered how $15 will get you Microsoft’s own DVD playing software unless you have upgraded to Windows 10 from either Windows 7 Home Premium, Professional, Ultimate, or Windows 8/8.1 with Media Center Pack or Pro Pack installed. But what if you didn’t upgraded to Windows 10 from any of the above mentioned predecessors, and also don’t want to give Microsoft, or anyone else, for that matter, money for something as simple and obvious as a way to play DVDs. Well, there is, indeed, another way. 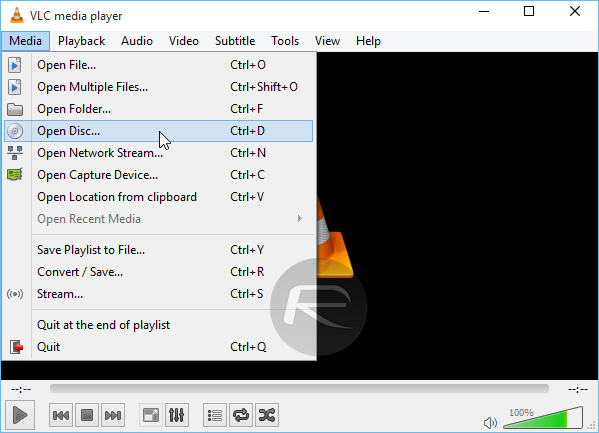 You’re probably familiar with VLC, the open source media player that has been a popular app for playing video files for a good long while now, but did you know that it can also be used to play those shiny plastic discs you’re hoarding? All you need to do in order to play your DVDs for free is install VLC, making sure that the Discs Playback option is selected during installation, and then pop your disc into your DVD drive. Now it’s just a case of clicking Media and then Open Disc. If you really want to cut down on the clicking, CTRL+D will do the same thing. Go on, you’ll feel like a media-playing god. Windows 10 isn’t the first version of Microsoft’s operating system to come sans a way of playing DVDs, and it won’t be the last given the move to digital streaming that we are in the middle of. Thankfully, there is – and hopefully, will always be – a free alternative to Microsoft’s own paid DVD playing software, so no need to spend $15 after all. You can get VLC media player for free from the official page (link provided below). Wrong. This is how to do it for free. Not all DVD software is free, so by definition you can’t just do what this specific article suggests with any DVD software. who the hell uses DVD’s anymore anyway? This is 2015 FFS! The fact that playing DVDs is such a relatively ancient activity is only another reason why Microsoft shouldn’t be trying to charge $15 to ANYONE for this activity, regardless what their previous version of Windows was capable of. Microsoft is just trying to get easy money from someone who may not know better. I’m glad Redmond Pie published this article. A staggeringly high amount of people… ? Why did they deleted my message ? I gave the link for a free blurray player that redmondpie mentioned months ago. I have 3 DVD drives installed on my build and that I use. How is it a bad article. It simply gives an alternative to Microsoft’s $15 DVD player app. Dvds may be ancient but still used today. I still continue to use Dvds for other reasons. BUT I agree $15 for a DVD player app is ridiculous. It could be the disqus spam filter that assumes it’s a spam link even though it isn’t. My posts were deleted at one time because of this even though they had no links in them. Problem is microsoft has to pay the people who hold the encryption / decryption for the encoding/decoding for the dvd format whoever owns that. As do everyone, hence they rather go digital, it’s cheaper less royalties and costs. Microsoft should be defamed. they are selling Spyware: The OS Experience under the name Windows 10. Windows 10 is the exact same as Windows 7, except with more crapware and less controls over your system. Hell, windows is using computers that have installed Windows 10 as torrent slaves to distribute Windows 10 copies Lawl, did ya even know that? It’s in the fine print, and you defending this piracy of your PC and bandwidth is nothing short of disgusting. Yea, I discovered VLC like 4 years ago. Never used anything else since, because VLC blows it all out of the water, fully customizable and plays A N Y T H I N G. Including a banjo. So Apple also has to pay the same licensing fees. I hear ya. But how come Apple gives away their DVD player software for free, while Microsoft is trying to pass the bill on to users? I am sorry about your deleted as well at one time. I understand but redmondpie had no rights to delete mine that they mentioned a free blurray player months ago. I got their link and posted here. They deleted it anyway ? That’s so strange, really. its just that VLC its for most the most reliable video software so is the first free option that comes to mind.. There are LOTS of free DVD players… why are we pushing this one on a news site? If this was a responsible news site, this article would have listed a few free players, given the pros and cons of each, and then given a recommendation… perhaps VLC would have gotten the recommendation… perhaps not… but this is just shameless advertising! Google free DVD players and you will see heap of bad/ugly adware, spyware and shareware. Honestly, why is VLS so popular? I mean, sure it can play media, but it can’t play the special feature discs, which is what kids like best, usually. Windows 7 was able to play these discs, but this motherf*ckin’ VLS stuff can’t!! VideoLan, if you ever bother to read this page (which you probably won’t), PLEASE FIX THIS!!! OR ELSE I’LL SUE YOU!! !